It’s amazing how simple and easy a “No Thanks” email is to write, and how much more civil it is than not responding at all. I’m sorry but (insert actual excuse). Thanks very much for reaching out. All the best. You can save that as a canned response in Gmail (I have 5 responses saved for all sorts of scenarios I run into on a regular basis). Sorry, but we don’t have a budget for outsourced X. In the course of running a business, you will be offered every service under the sun from freelancers, agencies, boutiques, and other B2B folks wanting your money. Instead of ignoring and archiving these emails, just send a quick “No Thanks” email. Then when you actually need their services down the line, you won’t be starting off with someone who shook their fist at you a year ago. A friend of mine likes to say that the only reason to start a business is to make other businesses money. This tends to be true at the beginning, when your spending on outside vendors far outstretches your profits. Keep it in check by saying no more often than yes. Sorry, but our companies aren’t a good fit. This is more common in the world of content, but it spills over into services as well. My wife runs a blog and we get tons of offers every week from companies wanting to advertise, partner, sponsor, or give us free stuff. In the last case, it’s always a no because taking free stuff is a good way to lose all credibility. In the other cases, most of the time the products or companies are just not a fit for the ethos of the blog, and we send a simple “No Thanks” email. Sorry, but we are going to pass on the investment. This is the one all entrepreneurs have read, probably more than once. But it is not so bad, because it gives you closure and frees mindspace to pitch more investors who may be interested. The worst situation is when you have a positive meeting with a potential investor, then you follow up via email once, twice, and hesitate to write a 3rd email because they have not responded. You check their Twitter account to make sure they are healthy and still in the country. You wonder to yourself, “why not just say no?”. Then you shake your fist and say “I’ll never take their money for any future project, will never work with them, and will never cat-sit if we happen to become neighbors”. 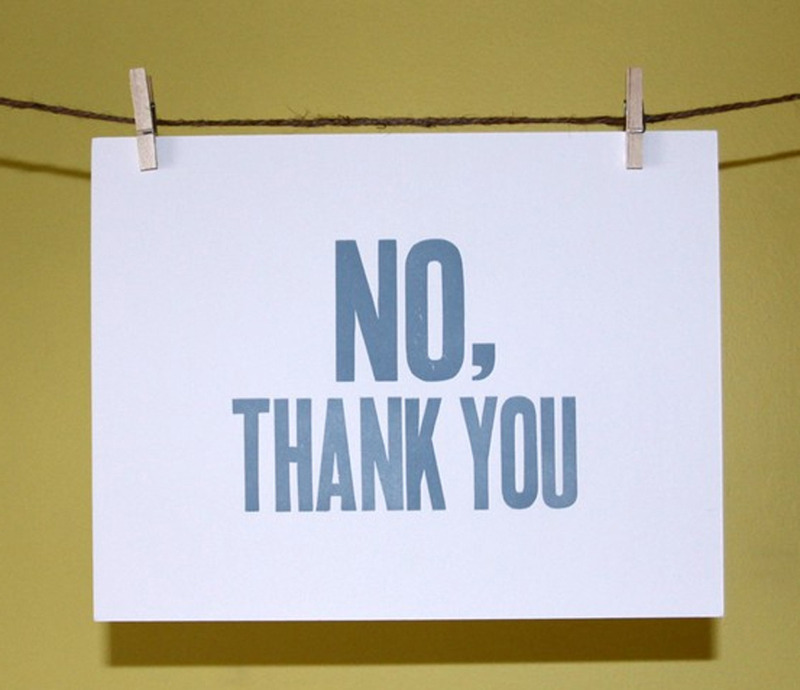 Take 10 seconds to write the “No Thanks” email. This way the person on the other end won’t waste their time wondering if you ever read it, and writing follow-up emails. Treat other people how you would like to be treated, even in business.